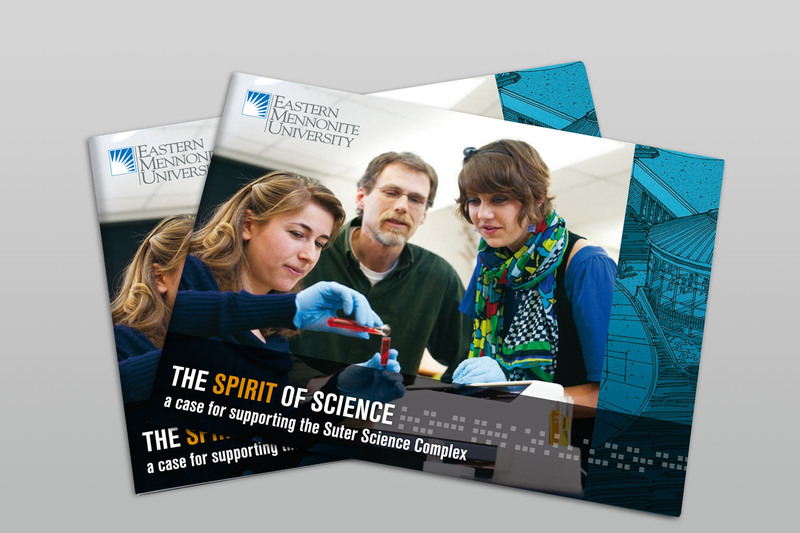 EMU’s science program is one-of-a-kind. Its holistic approach reflects the university’s values – combining high-tech, hands-on learning in a liberal arts environment with Mennonite values of sustainability, social justice and service. But in recent years it became apparent that the quality of EMU’s science program was not being matched by the quality of its facilities. EMU was in need of a new science complex that could offer new teaching and research labs, ample access to advanced technology, and the ability to expand programs and develop new fields of study. Many years of planning had already been invested in the campaign by the development team. The groundwork had been laid in the “silent phase” and some key donations secured. Now it was time to take the $30 million campaign to a more public level. What was needed was a piece that would serve as the main launchpad for conversations with alumni, donors and friends to raise interest and excitement as the project moved into a more public phase. 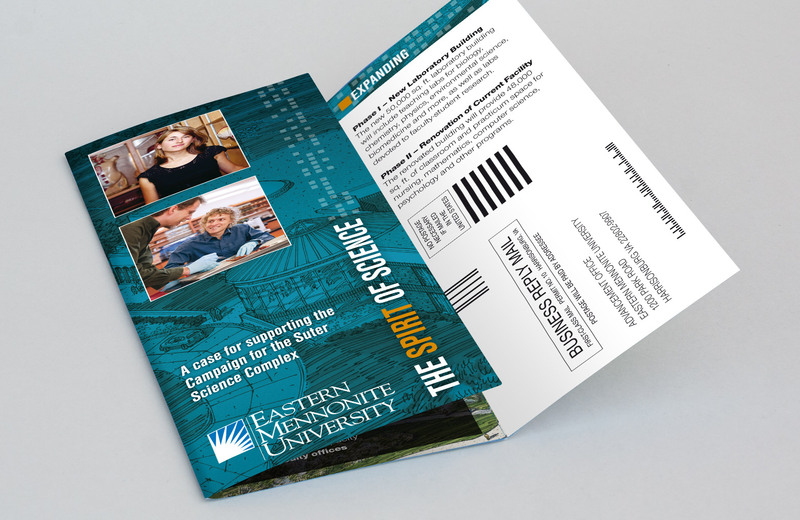 The piece should focus on the strengths of EMU’s science program, present the new science complex project in a concise way, and outline the various giving opportunities. 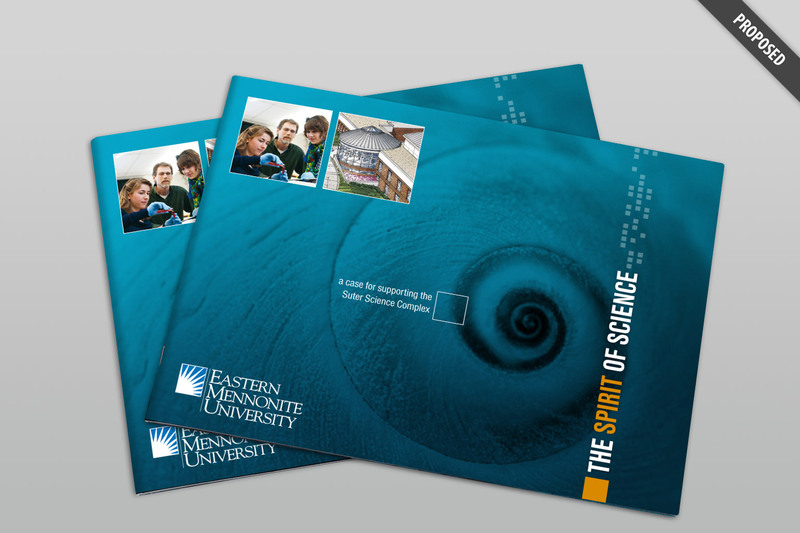 To develop a 16-page “viewbook” with a strong focus on the people behind the sciences at EMU. The book would be a companion to a short documentary-style video about the science program and project. The book itself would be light on text and leave ample room for images and short profiles. 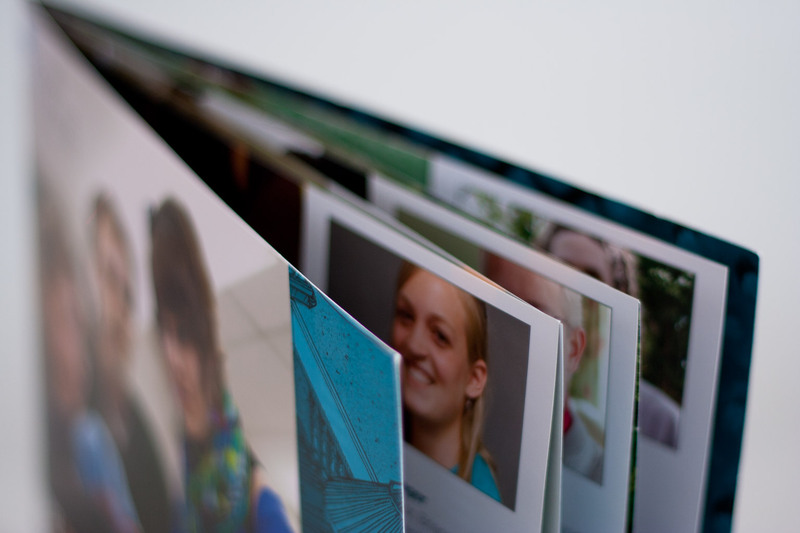 A pocket in the back cover would allow for the addition of various inserts that would provide up-to-date info, audience-specific data, etc. The pocket would also hold the DVD and the business card of the person presenting the project. 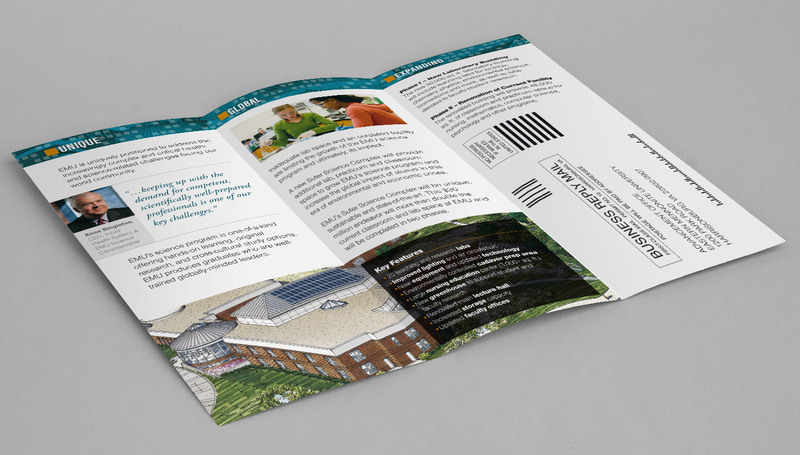 The project was guided by Gravity Group of Harrisonburg, Virginia that worked closely with the university development and marketing folks to develop the right focus and messages. The emphasis of the campaign is on “the people” behind the program – more specifically, on the impact that EMU grads are making in their communities and around the world. I proposed a horizontal layout because it lends itself well to the use of a “sidebar” where we could focus on alumni and student profiles. Since the additional inserts for the back pocket were to be in standard letter size (so they could be updated on-the-fly by the development staff) the format of the book needed to stay somewhat standard. So the horizontal orientation was also one way to introduce something different from a standard book layout. I included the image of the proposed cover even though it did not make the final pick (for various reasons) because I feel that design-wise it was the strongest. The nautilus pattern not only provides a perfect tie-in with the inside spreads (which also use backgrounds of patterns in nature) but also serves to draw the viewer’s attention and consequently to open it up. Inside the viewer will discover that the spirit of science at EMU is the people. This version of the cover also moves away from what we so often see on the cover of science-focused material – students peering through a microscope or working in a lab. So I was a bit disappointed when this version did not make the final cut. But so is life for a designer! It has been exciting to be a part of this $30 million endeavor. The project will more than double the current classroom and lab space at EMU. The new Suter Science Complex will be unique, sustainable and state-of-the-art. Today (May 11, 2011) the campaign is still in its early stage, but much progress has already being made to reach the goal. The viewbook has been an invaluable tool for the campaign steering committee and the development folks as they connect with EMU grads, friends and potential donors. I’ve received much positive feedback on the design of the book and hope to soon be able to post a few of the specific comments here. We were thrilled to have Mike take the lead on the design of our capital campaign materials. His solid design skills and experience guaranteed a final product that is creative, appropriate, and connects effectively with the university’s alumni, friends and donors.